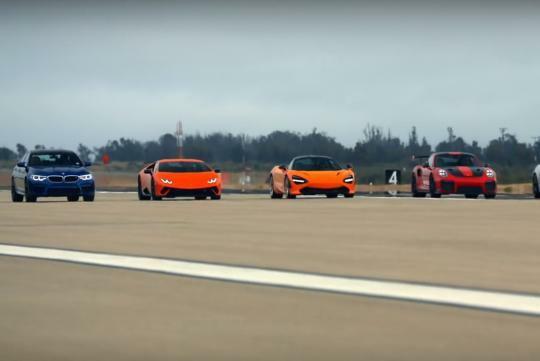 Motor Trend's World's Greatest Drag Race series is back for the eighth installment. 12 cars will race together in the quarter mile drag. Cars featured in the race include the McLaren 720S, Porsche 911 GT2 RS, Honda Civic Type R, Lamborghini Huracan Performante, BMW M5, Ford Mustang GT PP2, Alfa Romeo Stelvio Q4 Quadrifoglio, Kia Stinger GT, Audi TT RS, Chevrolet Corvette ZR1, Mazda MX-5 Club and the Aston Martin Vantage. Watch the video for yourself and see which car wins the race! And the thing that blows me away is that the Tesla beat all of these super cars. And those are all very fast cars..